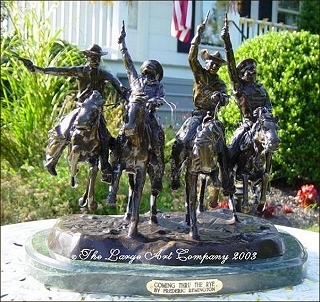 Frederic Remington Coming through the Rye is one of our most popular sculptures and despite the cost, the original size of 29" tall is our most popular size. This is another classic Remington sculpture. Here he depicts 4 horseman riding together at full gallop. The history is that these men are jubilant after returning from a long cattle drive. This is a very handsome sculpture and would look great in many settings. You can order the medium, small and mini sizes here of we have a separate listing for the original size with pictures (click here).